A bicycle headlight is a favorite bike accessory that benefits not only the rider. While they can be helpful for seeing where you’re going in low lighting, they are also beneficial for vehicles – making you more visible on the road. However, not every bicycle headlight you come across is going to be the right ones for your needs. There are a few things to consider before buying bicycle headlights. The price, of course, plays a considerable part in the decision-making process, but so too does the quality. If you select a low-quality headlight, you run the risk of either going through batteries more often than a better one or it not lasting as long. 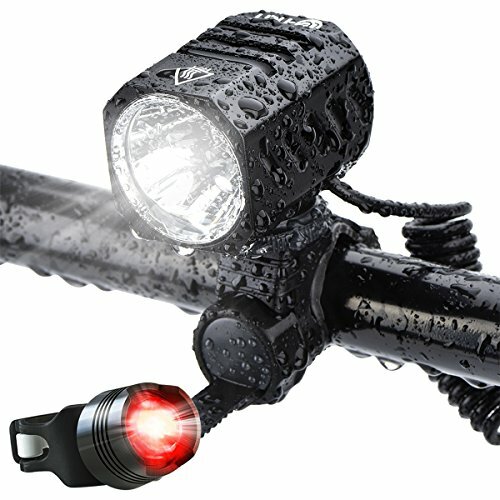 The ideal bicycle headlight is one that is waterproof so that it operates in the pouring down rain, and you can recharge it on your computer. By doing so, you don’t have to spend a significant sum of money on batteries every time you ride. However, the best headlight for your bicycle is also one that offers various lighting options. If it can flash, strobe, or remain on, it’s one that will prove to keep you both visible and guide the way. Here are a few of the many options you may find suitable. 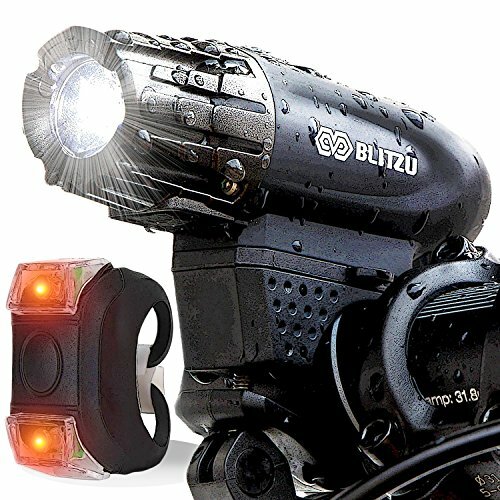 This bicycle headlight from BLITZU will become a firm favorite in your household in no time. Not only can you use it on your bike to guide your way, but you can then remove it in a few seconds, then attach it to your motorcycle, scooter, boat, skateboard, and more. Because it’s so versatile and easy to install, it’s suitable for all manner of applications. However, the benefits don’t end there. Unlike other headlights for bikes on the market, the vibrancy of the bulb is incredible, not to mention the reach. It provides a lumens output of 390, as well as beaming that light for up to 300 feet. If you need to see what’s ahead but you also want people to see you, this is a valid option for your requirements. You will also enjoy how suitable this light is for all weather conditions. Even if it’s pouring down with rain, you’ll be able to ride your bike with the knowledge that the water-resistant outer shell will prevent it from becoming damaged or broken. Then, when it runs flat, you can charge it via the USB port to either a power source, a computer, or a power bank, benefiting from two hours of run time. If you prefer riding your bike at night, or you have no choice, then it’s crucial to have a bicycle headlight. Without one, not only can you not see where you’re going, but you run the risk of not being visible to other traffic and people as well. A bicycle headlight makes your travels far safer, without spending the earth. If you want to benefit from the most bang for your buck, however, you will find this bike light from Te-Rich is the answer. Not only does it produce 1,200 lumens thanks to its exceptional LED technology, but it’s versatile and suitable for a range of different bikes as well. You can see every bump in the road thanks to the quality light, as well as not even faltering once the rain sets in. Because the outer shell is waterproof, you can rest assured water will never be a problem. Even if your bike journeys are long, this bicycle headlight will continue to deliver. On one single charge, you can get around 12 hours of run time if you keep it on a 25 percent brightness. You can also choose from 100 percent brightness, medium, and strobe. Use it for your bike, a boat, hunting, sailing, camping, and more. The options are endless for how versatile this bicycle headlight can be. As the name suggests, this bicycle headlight is a bright one that will provide excellent visibility in the poorest of conditions. 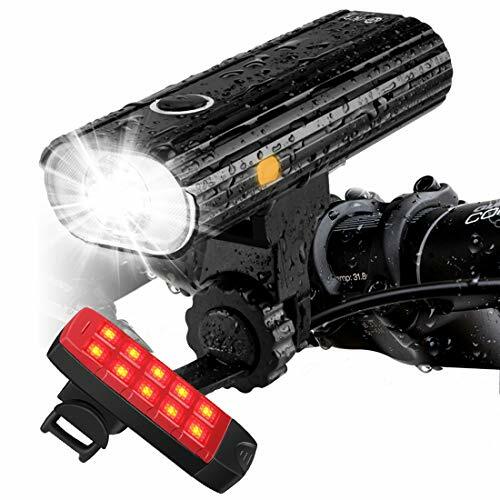 Whether you’re riding in the pouring rain, or you’re on your way home from work in the pitch-black night sky, you will find this bicycle headlight will light the road with ease. What most people like about this bicycle headlight is how long the battery lasts. Many lights on the market offer around two hours of run time, if that. However, your bike rides can often last far longer, so what do you do then? Bright Eyes solves the problem by offering three versatile light settings. If you run the light on high, it will last for four hours. However, on the lowest setting, you can benefit from 16-plus hours. It can’t get any more convenient than that. What’s more, it uses some of the best technology to provide 1,600 lumens, while running on a waterproof and robust 6,400mAh battery. It outshines the competition in more ways than one. And, sealing the deal is the lifetime warranty on the headlight as well as a one-year warranty on the battery. Suitable for all occasions, you will be more than impressed with what this light has to offer. 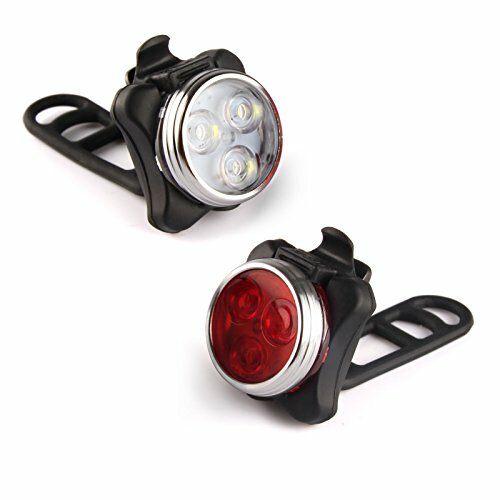 If a bicycle headlight alone is not enough to keep you safe when cycling, then the addition of a tail light will make you stand out far better. If you’re riding in low light conditions such as at dusk and dawn, you are at significant risk on the road. Drivers can’t see you clearly, but by adding a bicycle headlight and tail light, you increase your visibility by miles. 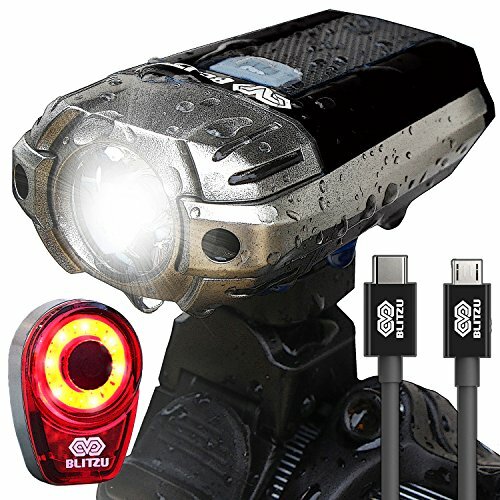 This set comes with a red taillight and a white headlight, both of which are chargeable via USB. All you need to do is plug the lights into a power source such as a power bank, computer, or tablet, then benefit from hours of run time. These lights are compatible with all bikes, they are easy to install, and are affordable to buy. There’s every reason to think they will tick all the boxes for your needs. This bicycle headlight from Cygolight does more than light your way. While it’s important to be able to see where you’re going, it’s equally as important for others to see you. Otherwise, you may find yourself injured or worse. If you don’t want to take the risk, it might be time to invest in this robust, high-quality and powerful bicycle light. It offers 700 lumens to light up your path, while also offering six different light modes for various situations. You can use high, medium, low, SteadyPulse, DayLighting, and Walking. Each mode provides various runtime lengths, with walking mode offering up to 15 hours before you need to charge it. However, the benefits don’t end there. You will enjoy how robust the unit is, even with daily wear and tear, as well as its water resistance. As a result, you can use it in the rain without a problem. Spend a little money and get a high-quality bicycle light that will continue to impress. Choosing a bicycle headlight that offers some of the best visibility is crucial, but it can be harder than you think. You need a light that can break through the thick fog, light up the night sky, and be visible to passing motorists as well. 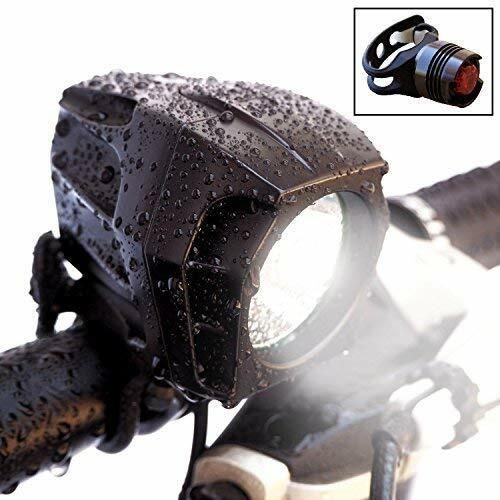 If you buy this bike light set from Apace Vision, you get all that and more. Not only do you receive a bike headlight with 300 lumens, but you also receive a rear light as well. The headlight offers a 120-degree beam which helps to provide the perfect amount of lighting to get to your destination at night. What sets this bicycle headlight apart from others, too, is how long it lasts, and how quickly it charges. If you put this headlight on charge for two hours, you benefit from up to 14 hours of run time. What’s more, the headlight is waterproof and weather-resistant, meaning no conditions are too harsh for this light. You can choose from five different lighting modes, turn it down, so the light lasts longer, then plug it in for a convenient and quick charge once you’re finished with it. No longer do you have to worry about keeping an endless supply of AA batteries. If you find yourself riding your bike a lot at night, you may soon realize how crucial it is to have a bicycle headlight. While you might be able to see where you’re going by following the light of car headlamps, no one else can see you. Therefore, you are at risk of being involved in an accident. You can significantly reduce that risk by purchasing this NightPro Vision bike light with near-blinding 550 lumens of light. Not only will you now see everything in your path, but everyone will soon see you as well. You benefit from up to 10 hours of run time, four different light options – low, medium, high, strobe, and a convenient charge function as well. Plug a USB cable into the charging port of your computer device then leave it. When you hop back on your bike, it will be ready to provide you with several more hours of light. 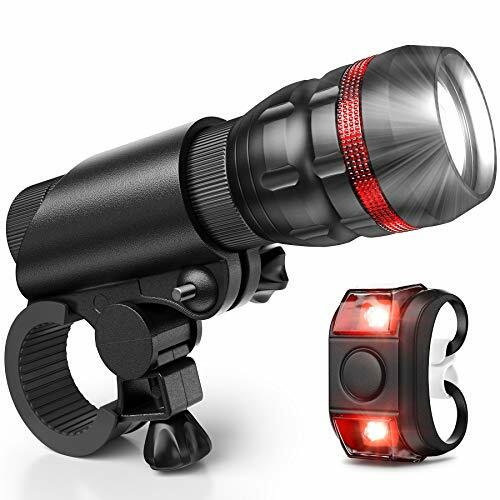 If you have an endless supply of AAA batteries and don’t want the hassle of having to charge your bicycle headlight, then this light from SXCtech is a good option for you. Not everyone wants the hassle of charging their bike light, especially when batteries are so readily available. Therefore, when you use this bike light, and the battery goes flat, you can put another one in and keep going. No fuss, no hassles! Aside from the power supply, there are many features to love about this bicycle headlight. It comes with a one-year warranty for parts, offers an exceptionally vibrant light to light your way, and features some of the best LED technology around as well. Therefore, you can rest assured that you will be visible while being able to see where you’re going as well. You can run the bicycle light on either low, medium, or high, benefiting from different run lengths. If you prefer to run the light on low, you can get as much as 15 hours or more out of one pair of AAA batteries. 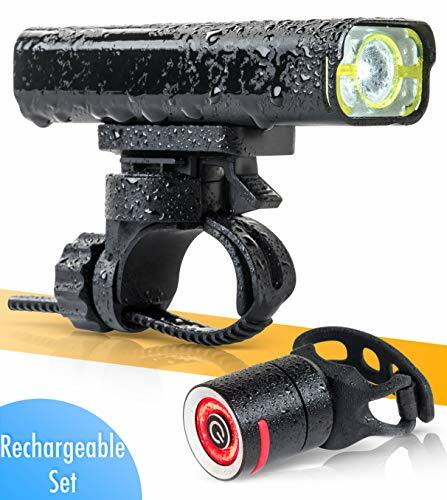 What’s more, this light is waterproof, robust, comes with a free LED taillight, and will provide no end of convenience to the user. Technology is changing at a rapid pace, and bicycle headlights are one of the many bike accessories to take advantage of it. Unlike most other headlights on the market, this one features a few unique features that may benefit you when you’re out riding at night. Not only does it have 700 lumens reaching over 160 feet, but it also comes with a light sensor. As a result, the darker it gets, the brighter your light shines. It also detects vibration, meaning it will turn off when you’re no longer riding your bike. However, the benefits don’t stop with the technology advancements. 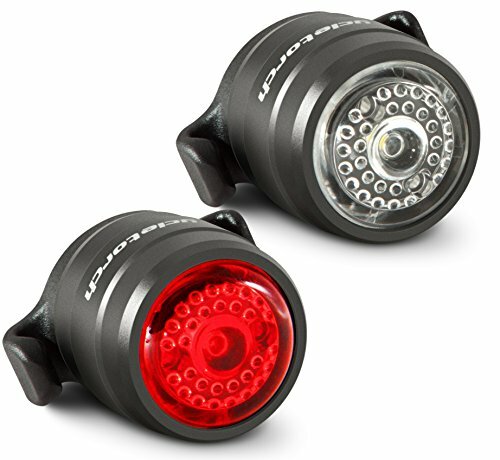 Not only do you receive a bicycle headlight for a very competitive price, but you also get a rear light as well. The backlight offers better visibility for drivers traveling behind you. Both lights are weather-resistant and waterproof, as well as being easy to charge via USB. If you want a set of lights for your bike that tick all the boxes, you will find these do.